With just seven more sleeps until Santa arrives this is the last edition of First Thing Monday for 2017. We’ll be taking a break from sending this out until the end of January – we figure most of you will be doing more exciting things at the beach. The Ultimate Job? 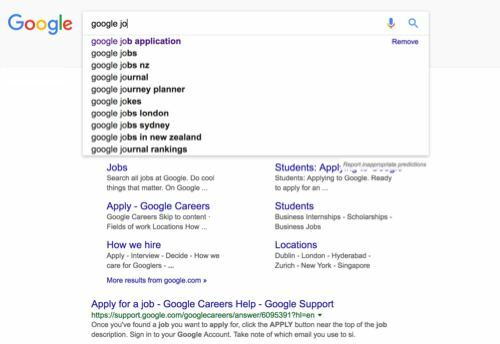 Google NZ is Looking for A Country Manager. Possibly the ultimate job for any leader of a digital marketing business in NZ. If you can make it through the infamous Google interview process this could be the perfect role. Unfortunately, we are all too happy here to apply but good luck to those that do. AdWords advertisers with small customer databases haven’t always been able to use AdWords Customer Match, while others haven’t always been able to target niche customer segments. That’s because Google requires a minimum audience size of 1,000 *matched* email addresses if ads are to be shown. With match rates typically in the 30%-50% range, that means your initial list needs to include at least 2,000 valid email addresses (the more the better). Worry no more. Google has expanded Customer Match targeting to include matches to phone numbers and addresses. Google has revamped its official SEO Starter Guide for the first time in over 7 years. Huge changes have occurred in the intervening period, so well overdue. The updated guide is now online, unlike the previous version which was a PDF. Google recommends the guide to anyone who owns, manages, monetises, or promotes online content via Google Search. The guide is a good primer for beginners, but if you’re expecting Google to reveal the deep secrets about their search algorithms you’ll be disappointed. Facebook CFO Dave Wehner has announced it will stop attributing overseas ad sales to its international headquarters in Dublin. The practice — widely used by other tech companies including Google, Amazon and Apple — has allowed the company to pay lower corporate income tax rates than it would have in the countries where the ads were actually sold. Ireland’a corporate tax rate is 12.5% while, for example, New Zealand’s is 28%. Changes come into place from next year. Direct ad sales in countries where Facebook has sales staff (27 of them, including New Zealand) will be attributed to those countries. Just what impact this has on Facebook’s NZ tax payments remains to be seen, however: the change will not apply to self-service ads. Google snippet length increased by up to 160 characters. What does this mean for SEO? Last week we reported Google had officially increased the length of snippets displayed in search results. Over the last week analysis has seen anywhere up to 320 characters displayed in results which is around double the previous advised limit. Prioritise your web pages and gradually work through them updating the meta descriptions and monitoring the snippet lengths displayed by Google. These changes are not guaranteed to be permanent so you still need to be vigilant in monitoring results.